Heating and cooling your home can account for as much as 50% of your energy usage. Smart thermostats are convenient devices for saving time and money while making your home more comfortable. Most models advertise savings of ~30% of heating and cooling costs and if you live in a colder state like CT (energy costs by state) that could be hundreds of dollars a year. One of the most valuable features of smart thermostats is the ability to remotely control heating and cooling, so you don’t have to run back into the house if you forgot to turn the AC off before leaving for work or a long vacation. These thermostats are also for people that would prefer to not have put a lot of thought into their heating and cooling schedules as some smart thermostats do most of that work for you. People that value a hi-tech aesthetic over a traditional beige controller box will also find that these smart thermostats are an attractive and functional addition to the home. Many of the intelligent thermostats that are available on the market today operate on adaptive learning to meet your heating and cooling requirements. These algorithmic formulas are coupled with motion sensors that are built into the thermostat that can detect your movement when you are home. This adaptive technology will then create an automated schedule for you that can also take into account local weather patterns. These devices are easily controlled via your smart hub device and smart phone and can be automated for additional convenience. These connections are established via proprietary radio signals such as Zigbee, for example, and communicate between the thermostat and the smart hub. The smart hub usually also has Wi-Fi so that a user can communicate via their smartphone over the local Wi-Fi. We have reviewed 4 of the most popular smart thermostats available on the market today including over 40 hours of product testing and interviews with consumers and HVAC professionals. Due to the increasing complexity of smart home product compatibility, we’ve included information on compatibility within each review. If you are interested in a smart thermostat to save energy costs, we also recommend reading our guide on home energy monitors. 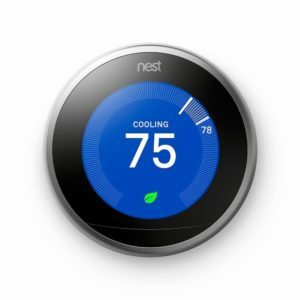 The Nest was introduced in 2011 and the Nest Learning Thermostat 3rd Generation still stands out as the best in category although there are now several worthy alternatives. None of the competing models have been able to replicate the Nest’s ability to blend into the background of a home and have the user almost completely forget about monitoring their heating and cooling system. The Nest features a simple and intuitive user interface that makes operation simple, while not sacrificing any advanced features. Users will find that automatic behavior starts to become apparent after about a week or so as the Nest’s adaptive learning framework does its work. The Nest will first learn your schedule through the timing of your manual adjustments or use its Home Away/Assist feature, which tracks family member locations via smart phone connections. In addition to studying your usage patterns, the Nest connects with local weather information and combines this data together to create heating and cooling patterns that are efficient and automated. 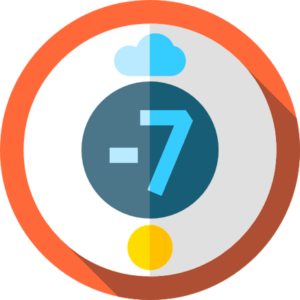 If the next few days are predicted to be colder, the Nest will turn your system on earlier those days so the house is warm for your scheduled wake up of 6:30AM. The Nest’s sleek design includes a solid metal ring that acts as the primary controller and a lot of sense when comparing it to a touch screen, and it has a solid feel when operating it that is consistent and highly functional. For those that are interested in the Nest, but that have yet to purchase a smart hub, you can wire in the Nest as you would normally connect a thermostat controller and then connect it to your Wi-Fi and then control via the smart phone app. It is for all of these reasons that we decided that the Nest was our Editor’s Pick. Remote control and monitoring. Users are able to control the temperature and humidity of their household via an app on their smart phone over the Wi-Fi or the internet, via a web browser. Users can also monitor current temperatures and usage and in some cases even be alerted of movement via email, which is a good security feature as well. Movement is tracked either from the thermostat or via secondary motion units on some units. An important note about thermostat systems in general: some thermostats require a common wire, also known as a C wire. This wire connects to your HVAC system and provides constant 24V AC to the thermostat. If you are missing this wire and your smart thermostat requires it, then you will need to run a cable yourself, or have a professional install the C wire for you. Professional installation costs are between $100 and $200. Luckily if you already have a preexisting thermostat module that you are replacing with a smart thermostat then you can quite easily install this yourself. Each manufacturer includes their own DIY installation instructions which are easy to follow. Many electrical utility companies offer a rebate once you install a smart thermostat (typically $50 or more). In some territories (particularly in California), utilities manage demand response programs which compensate users for adjusting their electricity usage during peak demand periods (7PM on Sunday as an example). As part of these program, users can elect to have their utility adjust their heating and cooling systems automatically via a remote connection to the smart thermostat. The Honeywell RTH9580WF Smart Wi-Fi lets you enter your zip code on their website, and then gives you details on how to go about processing your rebate. Unlike other smart home products such as smart lighting, many of these units don’t require a smart hub, although if you have one, the Emerson Sensi Wi-Fi Thermostat 1F86U-42WF and Ecobee3 lite Smart Thermostat will work with a Wink Hub as well as Wi-Fi. Each model comes with its own compatibility requirements, so be sure to check out which model will suit your setup best. The Nest unit is probably one of the most advanced self-learning appliances on the market and not just the thermostat segment. It is able to detect when you are at home or out of the house and then learns your schedule. All that you need to do is set your temperature manually for the first few days and then once the Nest has learned your preferences and schedule it will start automatically adjusting your home’s temperature. The controls are very simple: there is a rotary dial for navigating menus and a single button (which is the unit being pressed in as one big button). The hardware controls are made to be simple because you will primarily be controlling your Nest from your smart phone or tablet via a Wi-Fi connection. The display of the unit is big and bright, although it is not customizable, giving you a blue backlit display instead. Users that are looking to customize their Nest unit can purchase additional metallic rings, such as brass and aluminum. The Nest unit is capable of 3 heating stages, 2 cooling stages and is compatible with a heat pump, an auxiliary emergency heat facility, humidifier, dehumidifier and fans. Check your system’s compatibility with nest here . The Ecobee unit is a runner up to the Nest and is an unassuming pebble shaped device that features the best touch screen in our round up. The company has taken a decidedly different approach to modernizing the thermostat than the Nest unit. Instead of relying on machine learning algorithms to adapt automatically to your heating and cooling needs, the Ecobee focuses on using a series of sensors that allow it to intelligently adjust the temperature and to keep it balanced. The sensors can work well for houses that have multiple stories and areas. The shortfall to the sensors is that if you only have one HVAC zone and two rooms with different temperatures, the system can only adjust to the room with the sensor. So if the room with the sensor is too hot, but other rooms are comfortable, the system may over compensate for the other rooms, which will increase your energy costs. However, if the difference between rooms is that significant, you should have your system checked out by an HVAC professional. The Ecobee has a Follow Me feature to work with the sensors, but that will not solve for the problem described above. Although the Ecobee does not have the same level of learning capabilities as the Nest, it comes with preprogramed schedules, which can easily be adjusted by users and also automatically adjusted using the motion sensors. This has reportedly worked better than the Nest for users that have less predictable schedules. The Ecobee is compatible with 2 heating stages and 2 cooling stages, 4 stage heat pump and 2 stage cooling pump, gas, oil and electric systems. The Ecobee is compatible with Amazon Echo, Apple Homekit, Samsung SmartThings, Wink, and IFTTT. The Honeywell unit is a smart thermostat that is a lower-priced option than the Ecobee and Nest. The price is lower as the Honeywell unit does not have the same adaptive learning algorithms as the Ecobee and Nest, but is a good option for users that do not require those features. The Honeywell also does not have the same motion sensing capabilities as the Ecobee. Instead of detecting movement to decide on whether or not to switch on or off, the unit relies on your input during the initial setup of the device. The Honeywell has Alexa compatibility, scheduling and wireless capabilities. The Honeywell unit is a full featured touch screen, Wi-Fi enabled smart thermostat, with plenty of energy saving capabilities built into it. The interface is clear and easy to use, while the touch screen itself is responsive and has vibrant colors. The themes of this unit can be adjusted, meaning that you can match the menu colors to suit your home décor. Because of its large touchscreen the Honeywell displays useful information such as weather reports for your region, humidity levels for your region and temperatures. This is good for people that just want information at a glance without having to navigate through a menu. The Honeywell thermostat is compatible with existing HVAC systems and can connect up to two heating stages and cooling stages. Cooling stages refer to your air conditioning system’s compressor, the first stage is for low level operation, meaning that the system doesn’t need to run too hard to cool the house. The second stage is for heavier operation, when the AC needs to work hard to cool your house. The same applies to your heating systems’ heat pump. Any issues that are detected in your system are brought to your attention via and on screen alert, or via the wireless connection to your smart phone or tablet. There is a weather forecast feature to help you plan your heating and cooling requirements in advance and adjusts automatically to keep your home at the right temperature. Smart integration is possible thanks to the direct Wi-Fi implementation built into this device, meaning that you don’t need a smart hub to make it work with Alexa or the Wi-Fi app on your smart phone or tablet. The device is Wink capable, so if you already have a Wink enabled smart hub then you can pair the device that way as well. The Emerson thermostat is the most basic model that we reviewed and could be a good low cost alternative to the other models. This model lacks a touch screen and weather dependent scheduling, and it also does not use machine learning. Instead it relies on manual programming, which can be done for a week in advance. But what the unit lacks in aesthetics, it certainly makes up for in functionality. The Emerson supports up to 4 stages of heating and 2 stages of cooling, and is compatible with electric heat and air conditioning. It can also handle gas, radiant and heat pumps, as well as dual-fuel systems. This unit does not require a C wire, unless it is being installed as a heating only or cooling only device, making for a much easier installation in many instances. Connectivity is handled by Wi-Fi, and the Sensei App allows users to control multiple thermostats from anywhere via their cloud infrastructure, and check local weather information for each one. Users that need more control over their heating and cooling requirements can adjust this via the 7 day schedule within the app. The Emerson unit also comes with a built in humidity sensor as well, allowing the air quality to be monitored as well.